Thanks to a strong partnership, Gentec has developed a fast, effective and complete know-how regarding robotic dispensing ready to be use. Our robots offer companies a competitive edge by increasing quality and productivity during the manufacturing process. 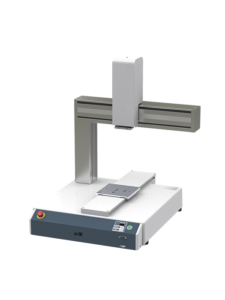 Cartesian Robot: available in 3 or 4 axes, it has a moving capacity within a range from 200 to 600mm. Scara Robot: offers an operating radius within a range from 250 to 550mm and has a moving capacity from 600 to 1000mm. In order to get a range of robots as diverse as possible, Gentec works in collaboration with CDV Solutions, another company of the RG Distribution group which ensures the drawing integrations and assembling. If you are looking for additional solutions, Gentec also offers a wide range of valves, consumables and even more. Ours robots are multifunctional and designed with both cell production sites and autmated inline installation in mind. Wih a rich catalog of functions including Fieldbus compatiblity, a built-in LAN port as standard equipment, software that makes camera installation easy and the ability to control up to two external motors, the robot is ready to fill many different manufacturing roles. Faster, more precise, with greater structural rigidity for long-term, dependable use; high speed tracking function for increased stability. We greatly shortened the after stop oscillation time for robots with a camera attached to the Z mechanism, cutting the waiting time between runs almost in half (compared with previous models). Maximum speed 900mm/sec and up; workpiece mass up to 15kg, tool mass up to 7kg. Built-in robot cable ; a first for our desktop robots. Highly effective for manufacturing facilities with height restrictions. Z-axis cable is integrated into the Y-axes housing for a more streamlined design. We’ve made the robot compatible with Fieldbus for easy inclusion in automated assembly lines and automated work stations. Set program numbers, start/stop operations, acquire position data and overwrite programs, all through the Fieldbus interface. Multiple module types: choose among DeviceNet, Profibus and CC-Link. By connecting to your PC you can send and receive teaching data as well as monitor the operations of multiple robots. Enhanced camera functions to match the needs of assembly facilities aiming for finer precision. In addition to our helpful position correction function, we’ve added functions such as an automatic calibration function and a CCD camera adjustment function. Teach up to 2 stepping motor or servomotor-driven « pulse string input type » external devices from the teaching pendant the same as with the robot axes. This function has many uses so you can « Set up a turntable to change the direction of the workpiece », « Set up a conveyor and control it from the robot », and more. To help personnel from a wide variety of countries operate the robot, we have 10 teaching pendant display languages built-in. You can choose: Japanese, English, French, Spanish, German, Korean, Simplified Chinese, Czech and Vietnamese. We offer specialized software for screw tightening specifications and dispensing specifications as well as highly versatile standard specification software.